The Nintendo Official UK Store continues to broaden its wares, having recently added The Legend of Zelda: The Wind Waker and New Super Mario Bros. wall stickers. 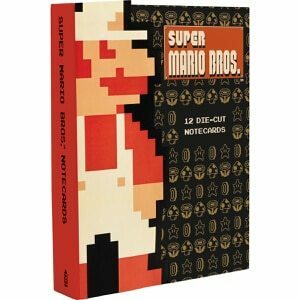 This week, that effort continues with new Super Mario Bros. stationery, which presents a journal, notebooks and notecards to liven up your life with 8-bit inspired goodness. Designed with artwork from the 1985 release of Super Mario Bros., this journal appeals directly to those who have a nostalgic connection to Nintendo. The journal features sophisticated production values (foil stamped cover, stained edges) and the game’s signature pixelated graphics throughout. 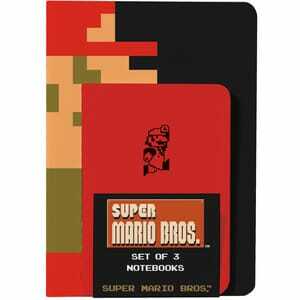 Designed with artwork from the 1985 release of Super Mario Bros., this set of three notebooks appeals directly to those who have a nostalgic connection to Nintendo. The notebooks (one blank, one lined, and one with graph paper) are portable and perfectly sized for meetings, class notes, and to-do lists. Featuring character designs from the 1985 release of Super Mario Bros., these die-cut notecards are just the thing for sending an old-school message. Mario, Luigi, Princess Peach and Toad are represented with bold pixel graphics. Each character is die-cut and can be mailed flat, but with a few simple folds, the card transforms into a self-standing paper sculpture. The cards are packaged in a sturdy portfolio box with envelopes.